Our expertise in offset printing is considered one of the reasons why we are confident we can deliver superior and competent service. Abbott & Co Printers & Packaging takes pride in its ability to operate Heidelberg presses, machines that are respected as the ‘Rolls Royce’ of printing systems. Our presses are capable of printing quality jobs from simple single colour to the more complicated six colour process, including coatings if required. Customer satisfaction is what drives us to achieve best practice service. To this end, we only utilize state-of-the-art printing technology, enabling us to demonstrate our commitment to provide solutions; solutions that help our customers achieve their goals. Be it Business Cards, Flyers, Letterheads, Brochures or Reports, Abbott & Co Printers & Packaging can take care of it. Our team of professionals is more than willing to listen and help you out with your offset printing needs. We are aware that you are in search of more than just simple printing. Our company, being one of the biggest printing providers, only offers a high quality service for offset printing. 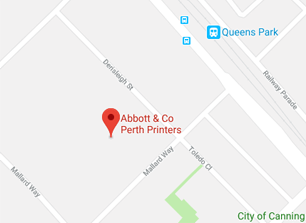 Abbott & Co Printers & Packaging is unquestionably dedicated not just to maintain its integrity and reputation, but specifically, to satisfy its wide range of customers. With quality as our top commitment to clients, the company is proud to announce that we are ISO 12647 certified and are, currently, in the process of applying for ISO 14001 certification. Quality, friendly service, and a passion to deliver nothing but the best to our clients is how we do our work, all aimed at achieving cost-efficiency for our customers in an environment-friendly way. And when we say cost-efficient, you can be sure that there will be no hidden charges on your offset printing projects.